Chepstow straddles the border of England and Wales on the lowest defensible point on the River Wye. As can be seen in the picture, the Norman stone keep dominates the town, perched on a long, thin, craggy clifftop. This is one of the earliest castles of its type, built in 1071 by William fitz Osbern. 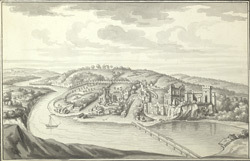 William Coxe, a clergyman who visited Chepstow in around 1801, noted: "The ponderous remains of the castle form a grand and prominent feature in this diversified scenery; they cover a large tract of land, and stretch along the brow of the perpendicular cliff which impends over the Wye." Chepstow's main industries by the 18th century were ship-building and repairs. The tidal surges in the river created the depth to accommodate large galleons.